Horace John, Forse & Co. have been leting commercial properties in Cardiff, and around the Vale of Glamorgan, for over 50 years. 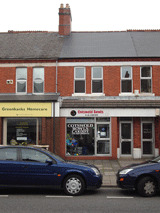 A First and Second Floor suite of offices situated in a busy suburban shopping area with easy access to Cardiff City Centre and the M4 Motorway. There is one car parking space available.